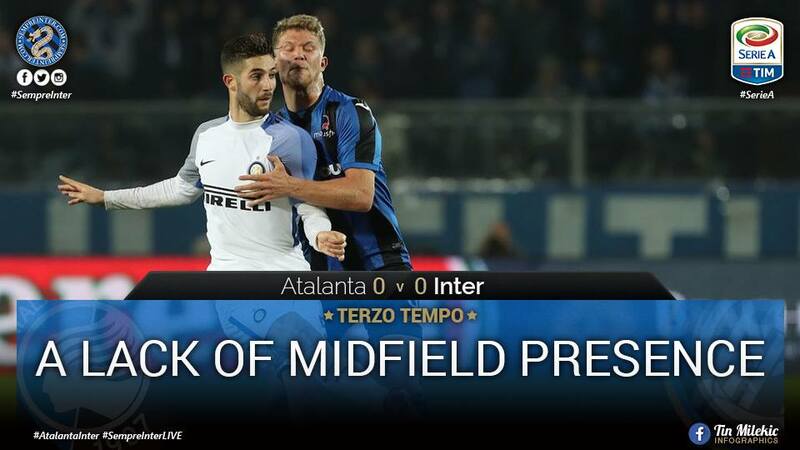 Today, Inter played Atalanta away from home in what was a game with a very strange feeling to it. Top tier, competitive Serie A games usually have an incredibly dense and compact midfield presence but today’s game looked like such an open and long game and that’s what really took a heavy toll on Inter. Secondly, Spalletti lined up differently in today’s fixture playing three at the back Miranda, Skriniar, and D’Ambrosio in front of them was a fairly flat line consisting of Cancelo, Gagliardini, Valero and Santon which supported the triangle of Perisic, Rafinha and Icardi. All though the formation to a bit of getting used to, in the second half Inter really stepped it up and seemed to be able to work better within the formation assigned by Spalletti. A reason that Inter made their own lives difficult is because in a three back, you need three natural centre backs and no matter how sufficient D’Ambrosio is out wide, his technical attributes just don’t fit that of a centre back. Another reason the formation seized to amaze from the first minute is because both players in the middle of the four are passive holding players with limited creative capabilities. In an ideal world the centre of that flat four would contain Brozovic and Gagliardini and if the team were to need a goal, Rafinha would be able to slot in and that flat line would shift into a diamond. The reason Brozovic is crucial in this flat four is because his box to box ability are much more rounded when he is in the form that he’s currently in which compliments Gagliardini very well. Unfortunately the midfield felt very bullied without his presence today which hindered the ability to build. In regards to the wide players in the flat four, Cancelo was probably the best candidate considering Candreva’s lack of form this season but the real issue arrises on the left side. Santon is right footed playing the left and he did so to the best of his abilities but the problem with playing an inverted winger (especially full backs higher up the field) is that they take their initial touch on their inside dominant right foot. They then have to either cut in or make the switch to their left foot to take the space which is time consuming and the fact that Atalanta played such a strong press rendered Santon nearly completely offensively useless. This would have been an excellent time to attempt a Dalbert start, not to much defensive responsibility and all the creativity in the world going forward. On top was a triangle consisting of Perisic slightly more central on the left and Rafinha in the same role on the right with Icardi up top. The fact that theres wing backs going up and down in this formation means that in order to maximize the formation, pace is key so instead of Rafinha Karamoh should have started with strong supporting overlaps from Cancelo and on the other side it should have been Dalbert and Perisic especially because on each side you have such high working rate players. These quick wings would’ve forced Atalanta to spread wide to stop the wide attacks removing bodies from the middle which would inevitably free up some central space for Icardi to go to work.